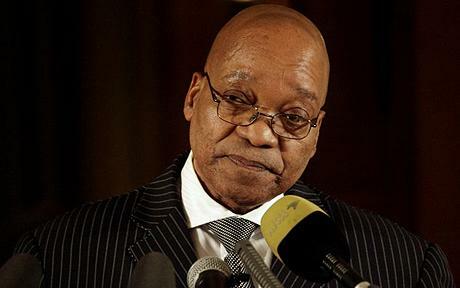 South African President Jacob Zuma was caught up in a personal corruption scandal that he "narrowly slithered out of." Photo by Reuters. The African National Congress is riven by factions, ambitious politicians, and an environment of jostling for power and position. Corruption is embarrassingly all too blatant while basic needs go unmet. CAPE TOWN, South Africa -- When I came to South Africa, I thought I was escaping the way our news programs are totally dominated by political coverage even though the election is months away and everyone knows none of this polling and hyped-up speculation matters until October. The fight between the Democrats and Republicans is an obscenely costly affair which none of our political pundits care to investigate in terms of why so much is being invested and what the likely payoffs will be, and to whom. In the U.S., of course, we have two principal parties, almost like two wings on a plane. The Republicans, now the captive of the hard right, and the Democrats, firmly ensconced in the center, partial to corporations but with some issues and positions that appeal to liberals and even parts of the left. Obama is posturing at being a progressive on domestic social issues while refusing to crack down on Wall Street fraud, and promoting Bush-style war on terror military interventions. Romney is running on a one-point program: blame Obama for everything wrong in the world. Both parties are beholden to money and the people who supply it. We are talking billions! Of course, this immense money power corrupts the whole system. The Supreme Court has just ratified the decision that allows it. In South Africa, corruption doesn’t grow out of the competition between two parties with more in common that you’d think. Here, there’s only one party that really matters -- the African National Congress (ANC) that is riven by factions, ambitious politicians, and an environment of jostling for power and position. Corruption is embarrassingly all too blatant while basic needs go unmet. Reality quickly set in. Racial division was only one of many economic and social problems, all impervious to quick fixes. The government soon found that it had to overcome many forms of resistance to change including the vested interests of the business sector, the status quo orientation of international agencies like the IMF and World Bank, as well as the go-slow counsel of Britain and the U.S.
A long suppressed black middle class wanted what it thought was its due and wanted it now! Inexperienced politicians luxuriated with new perks and fancy cars, quickly putting their needs ahead of demands from their constituencies. Corruption soon surfaced and was largely ignored. The unity of the liberation struggle gave way to power games of every kind. The Mail &Guardian reports political scientist Achille Mbembe saying in a debate in Johannesburg, “after 18 years of relative complacency and self-congratulatory gestures” the ANC was realizing South Africa was an ordinary country and not a miracle. But then AIDs emerged as a fatal health problem, catching the country off guard. Its health infrastructure had been crippled by years of apartheid underfunding. Early projections suggested that virtually the entire State treasury would have to be diverted to stop millions from dying. There was denial and stigma. That was one of the realities confronting Mandela’s deputy and successor, Thabo Mbeki. That may help explain his attempts to downplay the AIDS threat and find others to blame for it. Mbeki had ambitious notions of an “African renaissance,” and turned South Africa into a force on the Continent while also alienating members of the ANC at home who resented what they saw as arrogance and elitism. Former ANC exile and military chief Jacob Zuma toppled Mbeki with populist rhetoric -- he sang a Zulu song, “Bring Me My Machine Gun” during his campaign even though he was caught up in a personal corruption scandal that he narrowly slithered out of. Now, some of the same pressures facing Mbeki are facing Zuma, as supporters rally to his Deputy President Kglalema Mothlane or Zuma’s Minister of Settlements, the charismatic former guerrilla turned billionaire, Tokyo Sexwale. Both seem poised to want to replace him. Supporters of ANC president Jacob Zuma will stop any attempts to discuss leadership issues at the ruling party’s policy conference this week. This is the unyielding view of sources within the ruling party, who told the Mail & Guardian they will “suppress” any attempts to discuss succession within the ruling party. So much for the state of internal debate, yet clearly Zuma knows he’s a facing a serious internal fight. As the country prepares to mark Nelson Mandela’s 94th birthday in July, South Africa is also facing a dangerous downturn in its economy thanks to the world financial crisis and soaring crime and unemployment. The spirit of many here remains infectious but there’s trouble on the horizon.